Welcome to my Philadelphia Area (Motorcycle) Resources page. While working in the Revzilla Boutique, I'm often asked by customers about local resources for everything from schools to maintenance to events. So here's a little page I've put together for you if you're searching for this type of information. Please feel free to contact me and let me know if you have any suggestions to add, or comments/changes you'd like me to know. It'll be a constant work in progress, so keep checking back for more updates. I may add a few things that are more relevant to the East Coast, rather than Philadelphia specifically. I'm going to add those last in each category with an "*" so you'll know they're not exactly nearby. But I think they're worth mentioning! Revzilla.com: Ok, I'm a little biased since I work here. But yes, we have the BEST selection of motorcycle gear in the Philadelphia area. Hell, the best selection on the East Coast. And especially for women riders. We're lucky to have a huge wall of options for women in the store. This is only half the wall, there's even more to the right! There's also a full boot wall and glove wall for both genders. But BEFORE YOU VISIT, please check the website for store hours, directions and product availability. The store does not carry Everything from the website! We're located right by the Philadelphia Int'l Airport. You can find me working there every day during store hours. See you soon! And of course, more than 75% of the store is stocked well for male riders. Quaker City Motor Works: "QCMW is the Philadelphia area's premier full service shop and source for vintage parts focusing on vintage British bikes. Give the shop a buzz and we can chat about what you need." As far as gear, they are a Vanson dealer and UglyBros Riding Jean dealer. These are the closest shops to Philly for new and used motorcycles including OEM dealers. Keystone State Cycles; Philadelphia, PA. Motorcycle, scooter repair in South Philly. They offer service on metric and Harleys. Quaker City Motor Works: Glenside, PA. "QCMW is the Philadelphia area's premier full service shop and source for vintage parts focusing on vintage British bikes". Spare Parts Company: Philadelphia, PA. SPC specializes in Moto Guzzi, BMW, Laverda, MZ, Triumph, and Ducati. But they might work on other bikes too, you just have to call them and see what they can do for you. Triumph Philadelphia; Manayunk (Northwest), PA. Triumph and BMW. But they do offer used and consignment bikes. This is where I found Goldie 2.0 after my little getoff last June. We've brought both of our Triumphs into TP to have work done including maintenance and major repairs and have had nothing but great experiences. Working Class Cycles: Point Breeze/ Philadelphia, PA. WCC is by appointment only. I've been there several times for tire changes and mounting Goldie's exhaust. It's definitely a place you bring your parts and supplies, and then WCC does the work. Yorick and Sons: "Yorick and Sons Moto is your premiere Fishtown Motorcycle Service Center. We are here for all your builds and maintenance needs." Philly Moto Girls Of course I have to mention my meetup group for women riders only. Men are welcome to come on rides and social gatherings as long as your woman is a member. Sometimes we need our own place to talk and feel comfortable about riding without feeling intimidated. I schedule a brunch or dinner once a month (riding to and from is optional, not required) Throughout Spring, Summer and Fall I try to schedule at least one ride pre month with different events sprinkled in between. Please join us! Triumph National Rally: Oley, PA Swap meets (vintage usually), bike shows, etc. at this annual rally. I haven't been yet, 2016 will be my first. So excited! 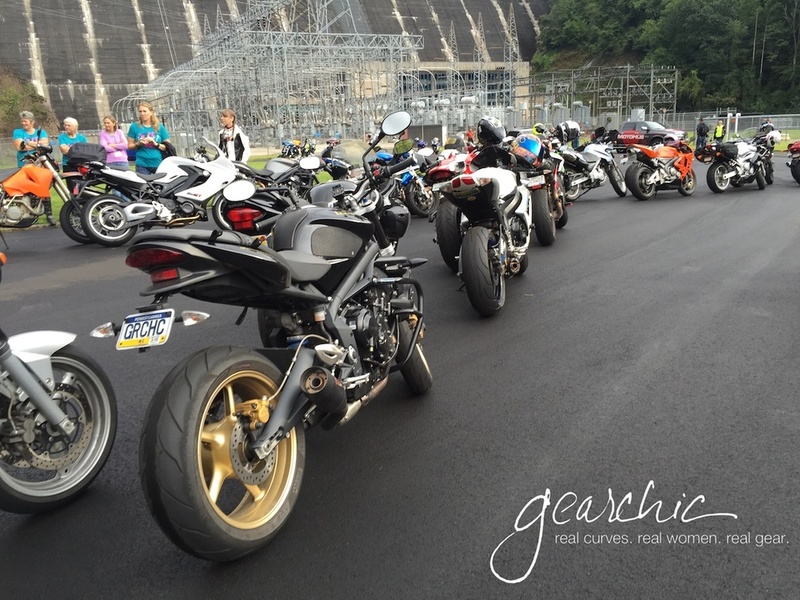 Hanging out with a bunch of sportbikes at the 2015 Rally, at Fontana Dam. Women's Sportbike Rally; Deals Gap NC. I know this isn't exactly in Philly but if you like riding incredible twisty roads with fantastic scenery, you should join me for this annual event the weekend after Labor Day. My first time was 2015 and it was fantastic. I look forward to going next year! Check out my ride report here. Message me on social media (@gearchic) if you want to add anything to this list. Thanks!